Vanilla bean shell with orange blossom buttercream and dark chocolate ganache. Vanilla bean shell with black currant buttercream. 1. Line two baking sheets with silicone baking mats or parchment paper. 2. Place the almond flour, salt, and powdered sugar in a food processor. Pulse until the ingredients are fully combined into a single powder. 3. In the bowl of a stand mixer fitted with a whisk attachment, beat the egg whites, egg white powder, and cream of tartar on medium-high speed until they reach the soft peak stage. Reduce the speed of the mixer and slowly add the vanilla sugar and continue beating until the stiff peak stage. 4. Fold the dry ingredient “powder” into the egg whites in three stages, folding until the mixture forms a thin ribbon. Transfer the mixture to a pastry bag fitted with a large, round tip. Pipe 1-inch circles, about a 1/2-inch thick, spacing the cookies 1 inch apart. Allow the cookies to rest uncovered at room temperature for 30 minutes. While the cookies are resting, preheat the oven to 350 degrees. 5. The cookies are reading to bake when they have lost their shine and are matte on the tops. Place the cookies in the oven and lower the temperature to 300 degrees. Bake for 15 minutes. Allow the cookies to cool on the sheets for 10 minutes before removing them. 6. To make the buttercream, fill a medium sauce pot 1/3 of the way with water and bring to a simmer. Place the sugar, salt, and egg whites in the bowl of stand mixer. Holding the bowl over the saucepot, whisk the contents until the mixture feels hot to the touch. Place the bowl on the stand mixer and beat with the whisk attachment until stiff peaks form. Once the outside of the bowl has reached room temperature, add the butter in small pieces. Add the vanilla. Switch to the paddle attachment and beat until the buttercream is smooth. 7. 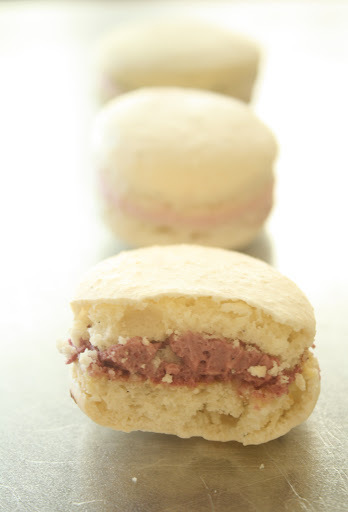 To assemble the macarons, smear 1/2 teaspoon buttercream onto the flat side of one cookie of each pair. Sandwich together with the corresponding shell, pushing the filling to the edges. Wipe off the excess buttercream from the edges. Ideally, the macarons should be consumed the day they are filled. If not, place the filled macarons in the freezer and defrost fully at room temperature before eating. You can replace 50% of the almond flour with pistachios, hazelnuts, or pecans to make pistachio, hazelnut, or pecan macarons. Grind them in the food processor with the other dry ingredients and proceed with the same recipe instructions. The buttercream recipe can fill about 200 macarons. I divided the batch into thirds and made each a different flavor. For example, add 4 tablespoons black currant puree to a third of the plain buttercream for a black currant variation. I created orange blossom and rose variations by adding 3/4 of a teaspoon of orange blossom water and rosewater to a third of the buttercream. For a richer, more sinful flavor, you could add a splash of amaretto or coffee lacquer. I highly encourage you to get creative with your flavor choices as the possible adaptations are endless. I am a pretty serious macaron connoisseur. I have visited the world’s finest macaron purveyors, from La Durée and Pierre Hermé in Paris, to Miette in San Francisco, and The French Corner Cafe in Palm Springs. Through my travels, I have identified three qualities that my fantasy French cookie should possess. 1. A light, barely crunchy shell. 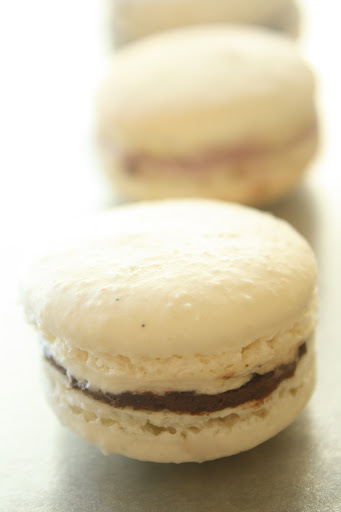 The macaron’s exterior should be slightly crisp, but airy enough on the inside that you can sink your teeth into it. 2. Fluffy filling. The filling serves as the glue that binds the macaron together, uniting two seemingly plain shells to create a single, magical partnership. The buttercream’s texture should be cloud-like and not overly sweet, complementing the cookie without overshadowing its earthy flavor. 3. Natural presentation. I am repelled whenever I walk into a bakery and view a pastry case stocked with macarons ranging from every color of the rainbow. I cannot help but imagine the artificial dyes required to produce cookies in hues such as neon green and sky blue. Macarons should be presented in their natural form, their nutty, organic origins embraced rather than disguised in seeping colors. While the cookies I had sampled over time had been delicious and unique in their own way, none merited the title of “The Perfect Macaron.” That was until last week, when I created macarons for the first time in a pastry class at The Gourmandise School of Sweets and Savories, located in Santa Monica, CA. These cookies are truly incredible. Upon first bite, the macaron not only satisfied my main requirements, but exceeded expectations entirely. Both flavor and texture are spot-on, the shape dainty and bite-sized. The recipe is also widely adaptable, allowing you to experiment with multiple flavor combinations while using the same base ingredients and method. I have to admit, I do not think such a stellar outcome could have been achieved had I not taken the class. The teachers demonstrated the process step-by-step, supervising the students as we completed the same tasks individually. On the first batch of cookies, I was hesitant and unsure of my movements, constantly pestering the instructors with minute questions. However, by the second round, I began to develop a rhythm and moved more swiftly through each step. The only way to understand the proper consistency for every component is through trial and error. If you are hesitant to attempt homemade macarons for fear of failure, I highly encourage you to try this recipe. While the first group of cookies may not be flawless, you learn the most from observing mishaps along the way. If you are an experienced baker, this project is an absolute must. For all the L.A. foodies, I strongly recommend visiting The Gourmandise School. The environment is airy and uplifting and the instructors are educated and helpful. The classes are just the right size: intimate enough that you receive personalized attention while large enough that you have enjoyable company. The School offers a wide variety of classes to choose from; everything from gluten-free desserts to ethnic fare. 1. In a small saucepan, whisk sugar, cornstarch, cocoa powder, and salt together until combined. Slowly stream in the half & half and milk, whisking to prevent lumps. Place the pan over medium high heat and whisk until the mixture starts to steam. 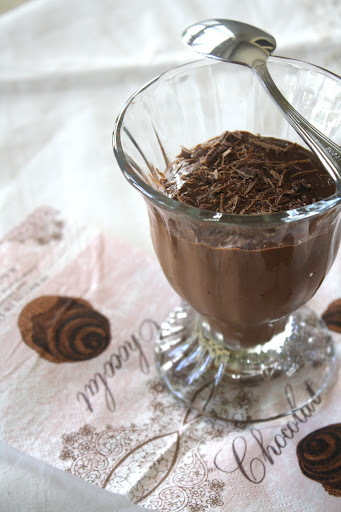 Sprinkle in chopped dark chocolate and continue stirring until it has melted and the pudding has bubbled and thickened. 2. Remove the pudding from the heat and stir in the vanilla bean extract. Pour the pudding evenly into serving cups of your choice. Place plastic wrap directly onto the pudding and refrigerate it until completely chilled, approximately two hours. Remove the plastic wrap and top the pudding with whipped cream and milk chocolate shavings. Light and airy, filled with tones of decadent dark chocolate, and topped with freshly whipped cream and milk chocolate shavings, this pudding is the chocolate lover’s dream. It is the ideal item to satisfy your sweet craving and can be thrown together in less than 15 minutes. Unlike the store-bought puddings that are packed with sugar and artificial flavorings, every bite of this homemade snack tastes like pure, unmasked chocolate. This would be a wonderful dessert to prepare for a summer barbecue, placed in vodka glasses and served with colorful, mini plastic spoons. For a bit of added crunch, sprinkle cocoa nibs or mini semisweet chocolate chips into the warm pudding while pouring the pudding in the cups.